As you know, a major humanitarian catastrophe is unfolding on Manus Island. Six hundred male refugees and asylum seekers are occupying the former Regional Processing Centre (RPC). Outside sits the PNG Defence Force, which is preventing food supplies, purchased by well-wishers, from entering the facility. The men have been told to move to three locations in or near the regional capital, East Lorengau. Two of these are not ready for habitation. All three are insecure and these men have legitimate fears for their own safety. 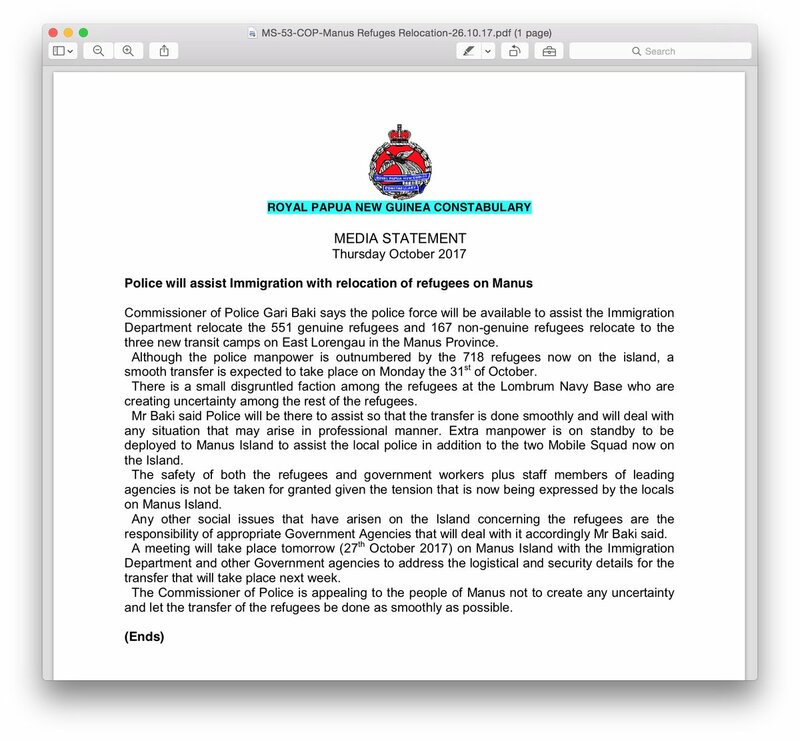 PNG locals have demonstrated their opposition to the move to the town in the last week with a vocal protest outside the centre and the Royal Papua New Guinea Constabulary Police Commissioner, Gari Baki, stated in a media release in late October 2017 that the safety of refugees is “not to be taken for granted given the tensions that are being expressed by the locals on Manus Island”. Paradoxically, the former RPC, with no access to food, clean water, sanitation, electricity or adequate medical care is currently the “safest” place for these men to be. On the evening of 4th November 2017, a man with a suspected heart attack in the former RPC sought assistance in Lorengau Hospital. This man was discharged from the facility without having an ECG or blood tests and returned to the former RPC. Thirty six hours later these essential investigations still had not been performed. With this level of medical support, it seems there is little hope for any refugee who becomes seriously unwell on Manus Island, whether they are in the former RPC or relocated to East Lorengau. This situation is a direct consequence of the Australian government’s arbitrary, indefinite incarceration of hundreds of innocent men in a hostile environment on a remote island in a poor country, unequipped in all respects to look after them. It must finally take adequate responsibility for the welfare of these men. The duplicity of the Australian government in this matter is eye-watering. On the one hand, the representations of Doctors for Refugees and others about the welfare of these men are referred on by the Australian government as “a matter for the PNG government”. On the other hand, we hear that Prime Minister Turnbull has once again turned down the New Zealand government’s offer to shelter some of these men. 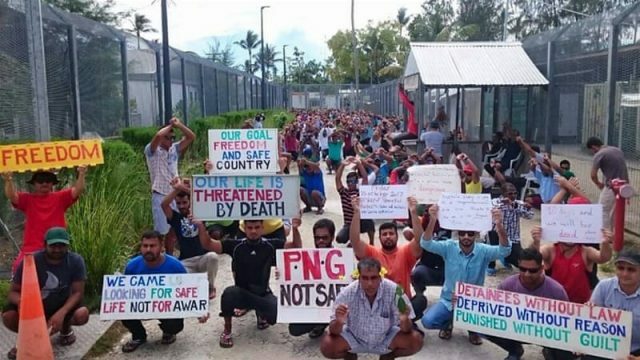 If the Australian government can dictate what happens to them then it is evidently responsible for their welfare and in fact PNG Immigration Minister, Petrus Thomas, explicitly stated last week that Australia will remain responsible for the welfare of these men when the Australian-funded centre closes.All pretence to the contrary must now stop. Amnesty International and the UNHCR have been condemning the detention and conditions of these men for years and this was first termed a situation amounting to torture over two years ago.Today, things are exponentially worse and we reiterate: we are heading for many deaths in the coming days and weeks unless urgent action is taken by Australia. Action to alleviate these men’s situation needs to be taken today to prevent deaths. As a start, they need food and water today. Julian Burnside is a barrister based in Melbourne. He specialises in commercial litigation. He joined the Bar in 1976 and took silk in 1989. He acted for the Ok Tedi natives against BHP, for Alan Bond in fraud trials, for Rose Porteous in numerous actions against Gina Rinehart, and for the Maritime Union of Australia in the 1998 waterfront dispute against Patrick Stevedores. He was Senior Counsel assisting the Australian Broadcasting Authority in the “Cash for Comment” inquiry and was senior counsel for Liberty Victoria in the Tampa litigation. He is a former President of Liberty Victoria, and has acted pro bono in many human rights cases, in particular concerning the treatment of refugees. He is passionately involved in the arts. He collects contemporary paintings and sculptures and regularly commissions music. He is Chair of Fortyfive Downstairs, a not for profit arts and performance venue in Flinders Lane, Melbourne, and Chair of Chamber Music Australia. He is the author of a book of essays on language and etymology, Wordwatching (Scribe, 2004) and Watching Brief, (Scribe, 2007) a collection of his essays and speeches about the justice system and human rights. He compiled a book of letters written by asylum seekers held in Australia’s detention camps. The book, From Nothing to Zero was published in 2003 by Lonely Planet. He also wrote Matilda and the Dragon a children’s book published by Allen & Unwin in 1991. In 2004 he was elected as a Living National Treasure. In 2009 he was made an Officer of the Order of Australia. He is married to artist Kate Durham.